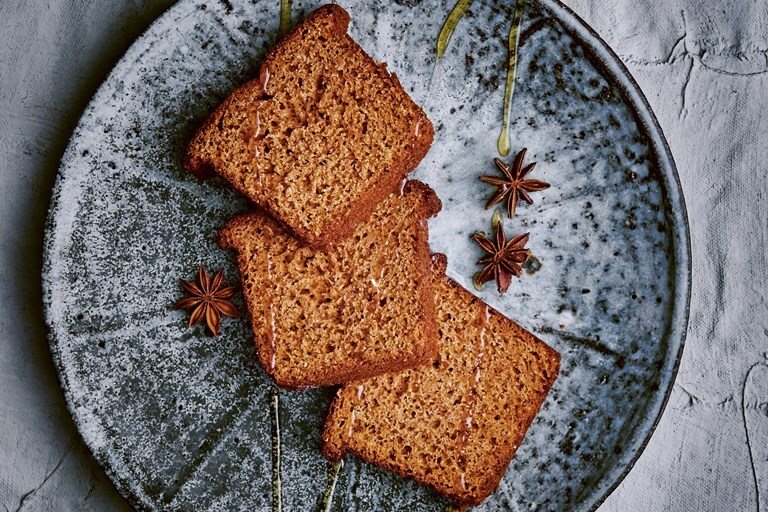 This pain d'épices recipe is full of warm, comforting flavours thanks to the generous amount of honey and mixed spice in the bread's batter. A classic French loaf that's simple to make and requires no kneading. This recipe is taken from Crumb by Richard Bertinet, published by Kyle Books. Photography by Jean Cazals. For me, as for most French people, this brings back memories of childhood – coming home from school and tucking into a slice with a glass of milk. It is a really simple recipe, and is quick and easy to make by hand. The addition of rye flour is traditional and it gives the crumb both a richness of flavour and a little acidity. Because the loaf contains a lot of honey, try to find a good one, preferably a single varietal, which will have much more of a distinctive flavour. I found a brilliant fir-tree honey that had a unique ‘green’ pine flavour, but orange blossom or heather would also be good. There is no need to rest the pain d’épices dough. Once baked, keep the loaf wrapped in greaseproof paper to prevent it from drying out.